2015 & 2016 versions --How to save a non-scheduled task. Part I: Create a 2015 Non-scheduled task. There is no permanent shutoff switch in either 2014 or 2015 versions but the user does have controls to save each task as "non-scheduled." If you want the task to be non-scheduled, you have to save each task using the "do not schedule" option. It is also possible to edit a scheduled task and change it to non-scheduled, but it is much better to save the task as "non-scheduled" during the original creation. Upon completion of the task creation, DO NOT click on the Save/"Backup Now" option. Instead, click on the adjacent arrow and choose the "Backup later" option. 1. From main Backups window, select/click the scheduled task needing changing to non-scheduled. 2. Click OPERATIONS BUTTON in lower left corner. 3. Click EDIT settings option. 4. Click OPTIONS button lower left. 5. Click the "DO NOT SCHEDULE" OPTION. 6. Click ADVANCED SETTING GEAR WHEEL. ...........Scroll down the listing just to determine whether any of the advanced settings needs changing. ...........Many prefer that the bottom most "if missed" option be unchecked. 7. To save the "do not schedule' changes, click the OK button (lower right). 8. To save the task changes, click the SAVE button (lower right). and need to be run manually in order for backups to occur. HOWEVER, due to a bug in 2015, the change to "non-scheduled" will not appear on the screen. The display screen will still show the task as "scheduled even though it is actually now a "non-scheduled" task. a system reboot is needed after the edit is completed. Grovers status = Inactive 1. Grover's New Revised Guides 4. 2014 Cleanup 2015 Cleanup 5. Attachments/How 7. TI 2015 FAQ. I do have a few more questions regarding the info provided and just want more general info I couldn't find in enough detail to know if I need bother. First, I followed the instructions on "how to save a non-scheduled task", but have one question near the end. After I click on "later", how do I go about starting the back up I set out to do? Do I click "later" and then proceed to click "back up now"? Did I miss a key point you mentioned or is that the correct path at the end? Did I misunderstand and I need to do part 1 and part 2 or is part 2 another option on how to accomplish this goal? Second question just to be certain I've got this- as long as I'm choosing "Entire PC" there is nothing I need to configure in regards to what I want included in that. It is what it says it is- the entire pc. If there is something I missed that I need to do , please elaborate if so. My last question regards the bootable discs. 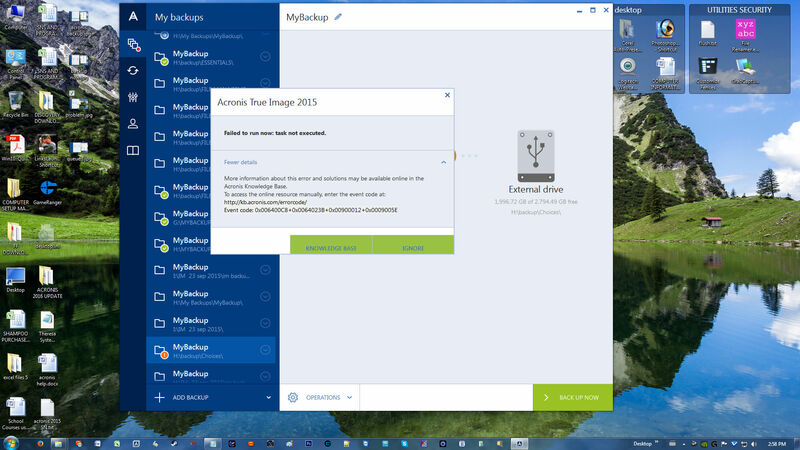 I had made 2 copies of bootable media onto CD's follow the steps Acronis gave for that. I heard mention on the u-tube video links that there is also an option to make a universal bootable media. Is that necessary for my situation or just an option for others who might need that ability? For me, keeping it the most simple, but accomplishing everything I want to in this backup is essential. I can't even begin to tell you how much I appreciate both your time and your patience!! If you have additional questions, post your them in the 2015 forum. This forum is used for references--not for question and answers. I believe you got your answers in your other posting but I will coplete so this is not hanging. This is not a forum for questions & answers. !. When a task is saved as a do backup "later", you simply click the "Back up now" option to create your backup manually whenever. 2. 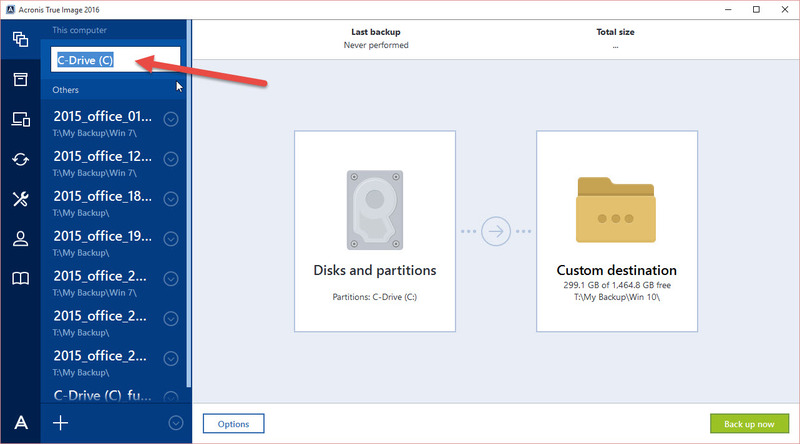 Selecting "Entire PC" is the best backup to have as it includes everything on the disk which is everything you need to create replacement disk. 3. If the basic TI Recovery sees both storage & target disks, it will suffice. a. If you have difficulty seeing both disks, then the WinPE offers a few more choices. b. 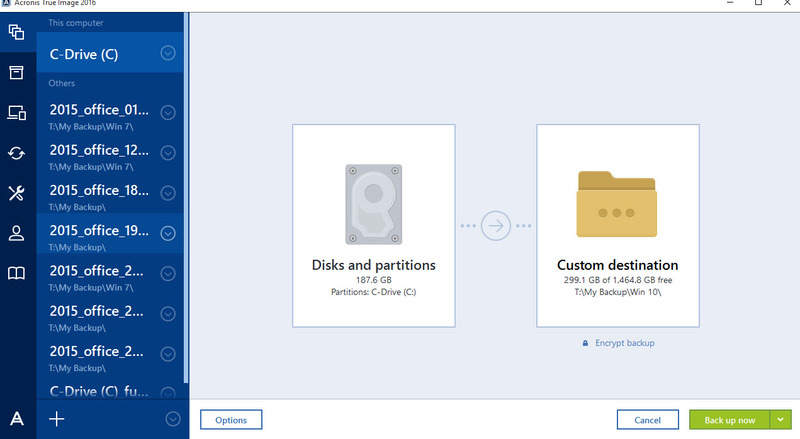 If it is your intent to restore you backup to a totally different PC, then you need the additional "Restore to Dissimar Hardware with Acronis Universal Boot. 2016 Version. Create Non-scheduled Task. Sample to save either scheduled or non-scheduled. Delaying the start of a scheduled backup enables the user to create custom task names or add date/time macros so default task names are not forced upon the user. User can create their own names but still stuck with the ending suffix which has been added to the last several new releases. I freshly installed 2016 build 6027. I tried to set "non-scheduled task" as you posted. 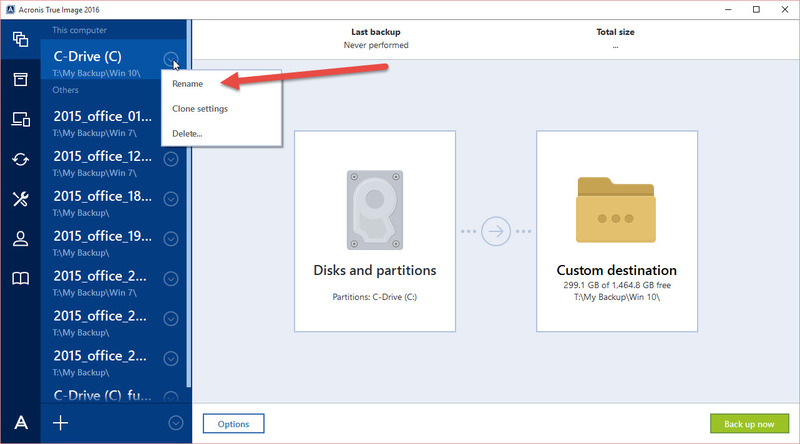 I could not bring up "Disk backup option" by clicking or right clicking on the right side destination box. Please see the attachment. please ignore the above post. I figured out how to set "non-scheduled task". I did it. Now my main question is how to change the name of backup tib files. As shown in the attachment ati_2. jpg, I clicked the downward arrow in the right side circle. I see "rename" (along with Clone settings and Delete). When I clikced the "Rename", folder name is highlighted (i.e., C-Drive (C)). See attahcment ati_3.jpg. The rename is for changing folder name. How can I change the name of tib names? Thanks. The function of the "Rename" option is change the name of the backup task, and the task name is what is used as the name of tib backup file. Refer this link in total. thank you so much for your assistance and the detailed tutorial. I have had success. Really appreciate your help I was going around in circles for over a week trying to get this to work. I had been successful previously but then all of a sudden It would not work. I set it up as a DO NOT SCHEDULE. and choose settings. should i save this or is it automatically saved before I go to the next step. Can you post a couple of screenshots? Backup jobs should only get que'd if another one is actively running. If there are no backup jobs in progress and you manually kick off a new backup, it should start to run at that time. Granted, there may be a little delay if the system is low on resources or the system is scanning to check for file changes that need to be backed up, but it's usually not very long before it starts. I have followed the instructions but it comes up the same and now I am getting atask not executed. It appears that you could have several issues going. The topic you have posted in is about how to create a task as a non-scheduled task, as opposed to creating a task which immmediately runs a backup. Some users want to run their backup at their convenience rather than on a schedule which is the purpose of my reference only posting. The illustration is designed so that you create a new task. Make all the settings and then click the "Later" option. If the scheduling option is set to "Do no schedule" and you click the "LATER" option, clicking the late option is what saves the task. 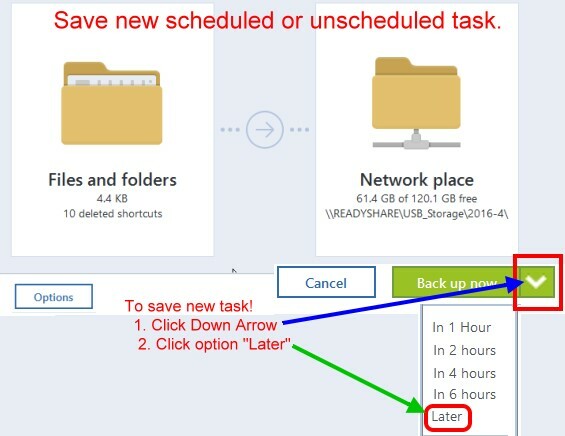 Once task is saved, then you click the "Back up Now" whenever to run that specific backup task to create a backup of the specific data you selected to be backed up. They should not go into Queque unless your already have a backup running. On any task whick is a "scheduled" task, edit that task and look at the scheduler setttings to make sure the option "run only when idle" is NOT checked. This option should be unchecked. Reviewing your attachment seems to indicate you have more than usual number of tasks. Each task is intended to be rerun multiple times as long as the target data being saved is the same. A new task is not needed each time you run a backup. The only time a new task is needed is when you wish backup something different than covered in the other task. It appears you "may" have many tasks with the same name. It is best that each task name differ slightly and that the each task have its own target folder so each task name is unique and there is no intermixing of tib files. All the tib files from a single specific task is best kept in its own unque folder Individual folders is not a requirement but it saves a lot of confusion when each task is kept in separate storage folders. Here is a couple links which could be helpful. why not create a new posting in the 2015 forum and explain the problems you are having. It would help if you would take one task which is not working and post pictures of the backup scheme as well as pictures of the target storage folder so we can get an idea of how the backups are being initiated. My examples (inside the links above) of GH11, GH12 and GH13 provide ideas on how to configure backup tasks where you want repetitive backups of the same data. 2015 forum to post additional questions. If your 2015 installation is an upgrade from a prior version, you may best be served by doing an uninstall using the TI Cleanup utiliity (my signature link #4) and start over with all new tasks designed the way YOU want them. Thank you again for your response Where do I find your signature Link # 4. I Just purchased the upgrade special offer package for 2016 But would like to try the uninstall and clean up before upgrading to 2016. You have given me a lot of really good information and thank you. I have had success with the backup prior to the last few months and I want to get back to having success again. I do like and trust Acronis and with people like you that give us help really makes a difference that you go that extra mile to help us. Check the bottom of Grovers last post ... #4 :). It's also #3 in my signature (bottom of this post). 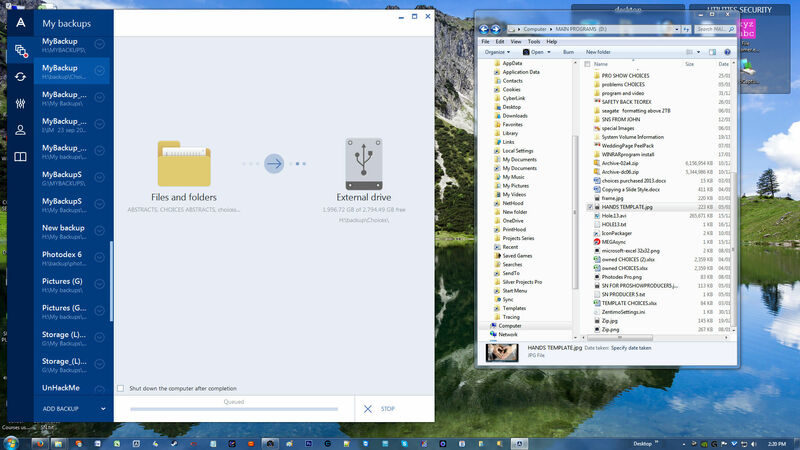 I still get the message backup queued and it appears like it is working but it never seems to complete tried again last night and left computer on with message to shut down when job completed. about 16 hours later when I checked, computer still on and still in queued mode. So got email about a sale to update to 2016 plus one extra copy so I purchased it. To get rid of all the notices of backup on left side of menu should I uninstall 2015 and then install the update 2016 and will this cure this issue I am having with the queued mode. Acronis Total Image is terminating the current operations, please wait. The computer will be turned of automatically in about two minutes. I change the ? mark to : in each case. Your wrote "Acronis Total Image is terminating the current operations, please wait. The computer will be turned of automatically in about two minutes. " Note this is a routine message. You will also get this in 2016 version. If you want to delete one of the listings along the left margin of main menu. Right click on the selected one and choose the Delete option and you will be offered the option to delete all (task & backup) or delete just the settings. In view of your problems, I would again suggest you run the 2015 TI Cleanup utilitiy, as per my signature link #4 below. This cleanup tool will both delete the install and do some cleanup if other Acronis stuff exists. This will get rid of all the tasks (but not backups) so you will need to recreate all your tasks again after the new install.